Following my morning routine abroad in Hanoi, Vietnam, I am riding the bus from my host family’s house to my classes at Hanoi Medical University. I am mesmerized by the thousands of motorbikes on the road. At least half of the riders are wearing facemasks to protect themselves from pollution. As I exit the bus, I can’t help but notice how difficult it is to breathe as my lungs feel caked in dust and particulate matter. While I am smiling as I am transfixed by the motorbikes honking at me to move despite walking on the sidewalk, the traffic and horns are a sharp contrast to the peaceful environment I have come to appreciate in the Crum Woods and on Swarthmore’s campus. At Swarthmore, the smell of Japanese honeysuckle and fresh rain accompany me to class each morning, but in Hanoi, the odors of smoke from street vendors, gasoline from motorbikes, and trash from garbage left on the side of the road overwhelm my senses. Back at Swarthmore, when in need of clearing my head, I can stroll through the Crum and get lost in listening to the rushing water of the creek and the chirping of the birds. Here in Hanoi, I am always aware of the motorbike sneaking up behind me and the street vendors yelling, asking me in Vietnamese to purchase something from their stand. I cannot lose myself completely in my thoughts, or else I will not be able to keep up with the quick pace of this city that is unlike any I have ever experienced. The outdoor space on Swarthmore’s campus, both inside and outside of the Crum Woods, is a precious resource that has become especially dear to my heart these last two years, and even more so now that I must try and seek solace in an area with little to no actual green space. The Crum Woods provides space for students and community members to meditate, reflect, and get lost in their own thoughts. It provides space for students to become the responsible, ethical, and balanced citizens that Swarthmore’s mission demands its students become. 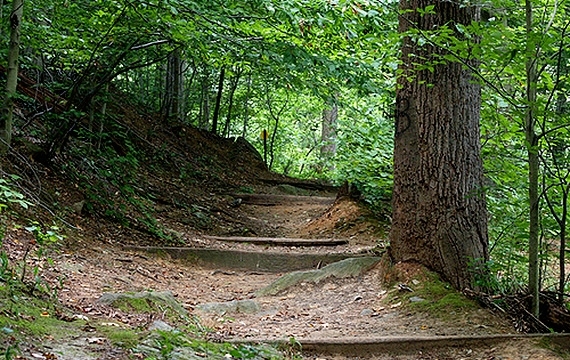 In a study conducted last year through the President’s Sustainability Research fellowship, the three most common words students used to describe the Crum were “beautiful,” “diverse,” and “peaceful.” Students discussed enjoying the Crum Woods because they use it for exercise and retreat from the college’s grueling academic atmosphere. Overall, they offered it relieves some of Swarthmore’s pressure that can sometimes become overwhelming. The Visioning Process Final Report the college published last year also found that better use of outdoor space was one of the top desires of students on campus. Still, students are not taking advantage of the natural spaces that exist on campus because they are “too busy.” However, what if making time to enjoy the natural resources that we have on campus became a priority? After all, studies show that time spent outdoors can actually make students more productive. According to the Huffington Post, two researchers from Stanford University found that walking outdoors boosts creativity, and researchers from the University of Illinois at Urbana-Champaign found outdoor activity is likely to improve concentration. Lee and Ingold, in their article “Fieldwork on Foot,” describe the value of the outdoors best when they state, “the rhythms of movement are very different and people draw attention to the specific qualities of the outdoors,” compared to the almost static movements of the indoors. I challenge you, Swatties, to make embracing the Crum Woods and the arboretum, in which you are all lucky enough to live and immerse yourselves, a goal this semester. Make time to take a walk in the woods, to listen to the sounds around you, and to notice how the natural environment actually improves your wellbeing, and perhaps even motivates you to finish your studies. While you’re at it, use events like the Scott Arboretum Tree Planting and Crum Woods Tours to motivate yourself to enjoy and conserve our woods. I challenge you to let the Crum Woods change you the way that the woods have changed me. It is because of the Crum Woods that I have come to understand the serenity that exists in the world although our fast-paced and routine-oriented lives attempt to tell us otherwise. I’ll never forget the comfort of the woods last semester when I was practically in tears after failing a paper. I was completely overwhelmed when I realized that I had to quickly recover from that paper because I had a biology exam and other readings to complete. I found myself storming into the woods to walk out my frustration. After a few minutes in the woods, my heart began to slow and my eyes began to dry. Hearing a Carolina wren in the distance and watching a squirrel happily scurry up a tree, a small smile spread across my lips. Though academics are important, there is so much more to the world than one paper. The woods are a constant reminder that there is so much more to explore and so much more life beyond stress. It is because of this peace from the Crum Woods that I have been able to reaffirm my own values and discover where I belong in society. Of course, as I am away from the Crum Woods this semester, I still wouldn’t trade exploring for Hanoi for anything. There are aspects of Hanoi that I love and that I could never find at Swarthmore. I can’t even begin to describe how astonished I am by the simplicity of life many people follow, eating pho for lunch on a little blue stool resembling that of a four-legged children’s seat from my childhood. I love the vendors who opt for pedalling around a bike to transport their fruit and goods in baskets, content with wearing a rice hat to cover themselves from the beaming sun. At Swarthmore, we complain about having to sit in our dorm rooms without air conditioning, never mind pedalling a bike in the 100-degree hot, humid weather, but that argument is for another article. Even so, there’s something to be said about valuing a luxury that many of us students don’t fully realize we have on campus. My experience in Hanoi has showed me how lucky we all are to not have to walk around campus with facemasks or smell garbage and toxins every time we leave the indoors. This privilege must motivate us to cherish and protect our woods even more, and we should make a conscious effort to appreciate and care for our natural environment the way it cares for us every day.